Sure, most of us have never had our vehicles stolen but it is a very real issue in many places. Until it has happened to you, I don’t think you can truly understand just how violating it feels. Cars are expensive, even if your car wasn’t ‘as expensive’ as some other cars might be it still cost you a pretty penny and the fact that someone might want to literally take that away from you is enough to make your blood boil. Cars these days are becoming more and more advanced, most of them come with clickers and some even have chips in the keys or literally don’t have actual keys at all. This can be both a great thing and a bad thing depending on how you look at it. It is much more convenient but it could be increasing the risks of your car being stolen. Cybertheft is something that could happen to anyone. If you have a car fob it needs to be properly secured when you’re not in your vehicle. 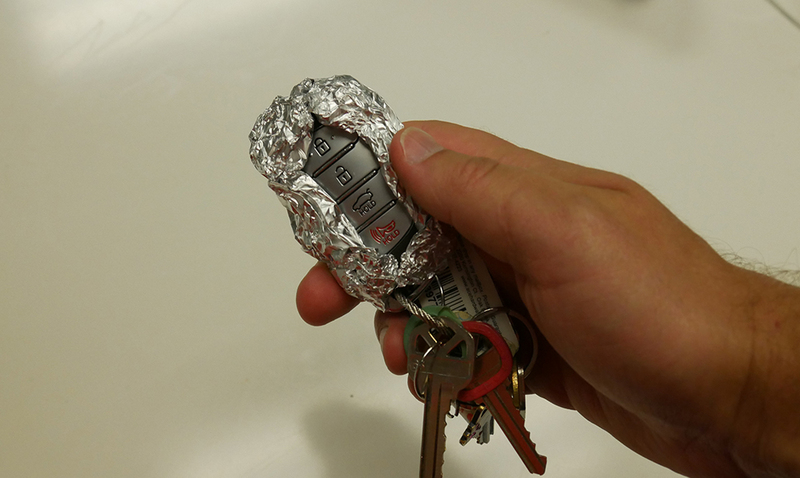 USA Today recently spoke with an ex-FBI agent that says the best way to prevent car theft is by putting your keys in a coffee can at night and wrapping them with aluminum foil during the day. I know, this might sound crazy but Holly Hubert really says it is the best means of keeping someone from amplifying your signal and using it to gain access to your vehicle. She says that copying the code from your key fob is nowhere near as hard as it should be and that we should be aware. I know, this might sound a bit out there but she really does know what she is talking about. Basically, these attacks trick the car into thinking you have your key and are there opening your car. It allows them to spoof a signal from the key to the car and get inside. Wirelessly unlocking your car might not really be something you think much about but in the world of thieves and hackers, it is something that puts a target on your back. Since each key fob/car security pair is unique, and each one can create billions of codes, hackers shouldn’t stand a chance. But it turns out that a popular system from Megamos Crypto isn’t as secure everyone thought. Still, it takes a skilled car thief or hacker to carry out this kind of attack, so the odds of it happening to you are slim. But thanks to always-on key fobs, there’s another risk that’s much more likely to happen. Always-on key fobs present a serious weakness in your car’s security. As long as your keys are in range, anyone can open the car and the system will think it’s you. That’s why newer car models won’t unlock until the key fob is within a foot of them. But for less than $100, criminals can get an amplifier that detects key fob signals from up to 300 feet away and then transmits them to your car. In other words, your keys could be in your house, and criminals could walk up to your car and open it. This isn’t just a theory; it’s actually happening. I know, scary isn’t it? I know I will be wrapping my clicker with aluminum foil from now on.